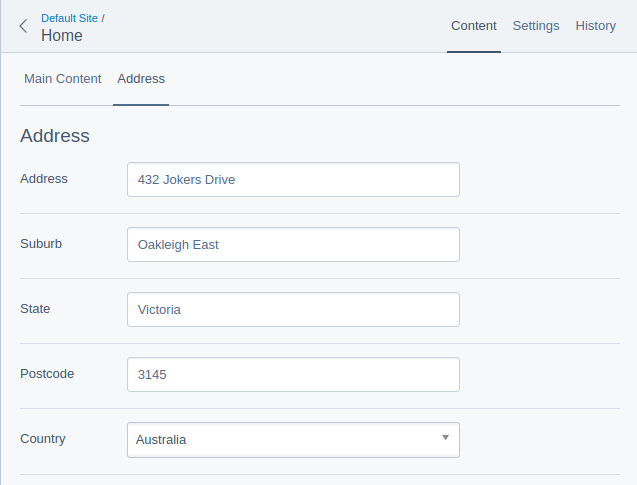 Adds address fields to a DataObject and also has support for automatic geocoding of the provided address. The static method address_to_point was changed to a non-static method called addressToPoint. This allows you to use the Injector and replace GeocodeService with something else if you need to. Addressable::set_allowed_states(array('' => '', 'NSW' => "New South Wales")); has been deprecated in favour of config values. Addressable::set_allowed_countries(array('' => '', 'AU' => "Australia")); has been deprecated in favour of config values. Addressable::set_postcode_regex(...); has been deprecated in favour of config values. NOTE: Previously there was a hack in Addressable that read Addressable::set_postcode_regex config value, then called Addressable::set_postcode_regex() to update the protected static postcode_regex; value in the Addressable __construct() method.